Twisted Stitch is not Always an Error. 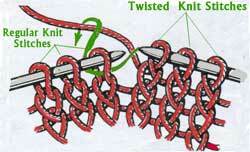 TWISTED STITCH is usually described as an error in the most of the knitting books. There are a few tips on how to avoid twisting a stitch. You don't make a regular knitted fabric look better if you twist a stitch by mistake. Meanwhile, as usual, even the "errors" can do a good job if you know how to use them properly. 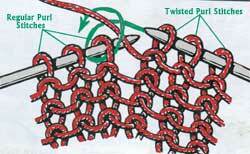 What is a TWISTED STITCH? Look at the stitches on the right. Those which are located on the body of the left needle are still untwisted , "normal". Their legs are not twisted around each other. While all the rest of stitches that are NOT on the left needle are shown twisted. Their legs created a cross at the base of each stitch. How can you twist those stitches ? We all use different techniques while knitting. If you would like to produce a neat looking fabric, try to remember that KNIT and PURL have to MATCH each other. Explanation about MATCHING STITCHES can be found at a Purl Stitch page. What should you do if you accidentally managed to twist the stitch? By the tip of the right needle remove the twisted stitch from the left needle. Pivot the stitch so you can see it untwisted and return it back to the left needle. Once you become more experienced, you will be able to correct position of the stitch without removing it from the needle. Twisting stitches is not always an error. 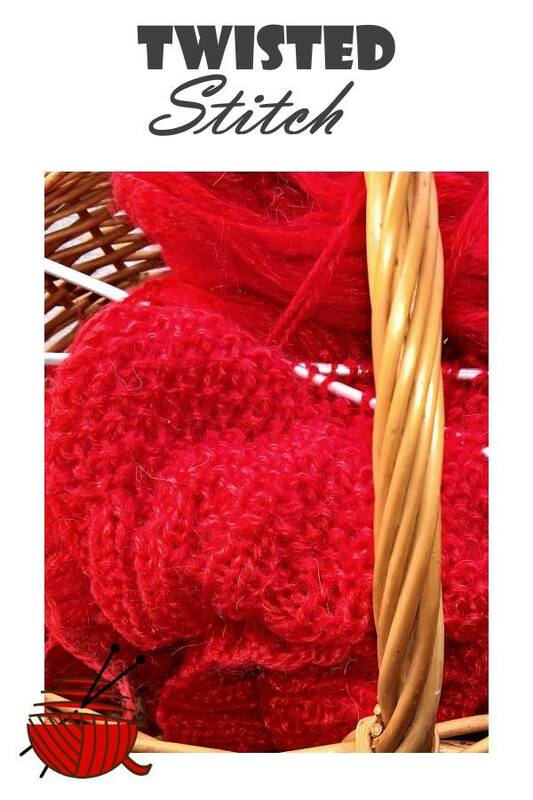 From time to time a knit pattern requires to knit a twisted knit or purl stitch. Often this simple technique brings a surprisingly decorative look to a knitted fabric. Here is one more example where twisting a stitch eliminates holes along raglan lines of the seamless sweater. Raglan increases very often are created by the yarn overs (YO) made in the knit (right side of knitting fabric) rows. In the next row yarn overs (YO) has to be knitted (if you are knitting your sweater in the rounds). It leaves the holes along raglan lines. They look decorative but it doesn't work great for winter garments. 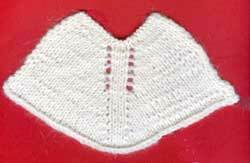 The size of the hole can be made much smaller if you use a twisted KNIT STITCH to knit a YO from the previous row. You can compare the results on my swatch. A top part of it is knitted without twisting a YO stitch in the next row. A bottom part has a YO stitch twisted in the next row. How to determine the way YO has to be twisted in the next row? You don't have to memorize any particular rules for doing this. Just try to experiment a little bit with your stitches. Insert the tip of the right needle through the legs of the yarn over, remove it from the left needle, twist it till you have a cross similar to the pictures shown above, and return it back to the left needle. Knit a twisted stitch the way you usually do it (through the front or back loop). After a few times doing this you will figure out the way of twisting YO without removing it from the left needle. Increases along raglan lines not only can serve for technological purpose, but also can be decorative elements for your garment. A few patterns of decorative raglan lines can be found at the Raglan Sleeves page.